OER can either exist in the public domain, or be licensed for reuse under a more lax intellectual property license, such as a Creative Commons license. OER can take many forms, such as: syllabi, lesson plans, videos, software, tests, teaching techniques, group activities, writing prompts, textbooks, learning modules, lecture slides, lab manuals, experiments, simulations, and course designs. There are no platform constraints. They can exist in a digital or print format. This comparison chart was developed by Kate Hess of Kirkwood Community College Library. Does OER use improve student learning? Yes! Dozens of national, peer-reviewed studies have been conducted on OER use in higher education over the past five years. None of these studies showed results in which students who utilized OER performed worse than their peers who used traditional textbooks or course materials. In fact, all studies showed that students who had unlimited access to their course materials and were engaged in open pedagogy assignments performed better or the same as their peers with traditional course materials and more limited access. For a complete list of every major study conducted on OER efficacy and/or teacher and student perceptions of such resources in actual practice, please see the Open Educational Group’s list of reviewed studies. 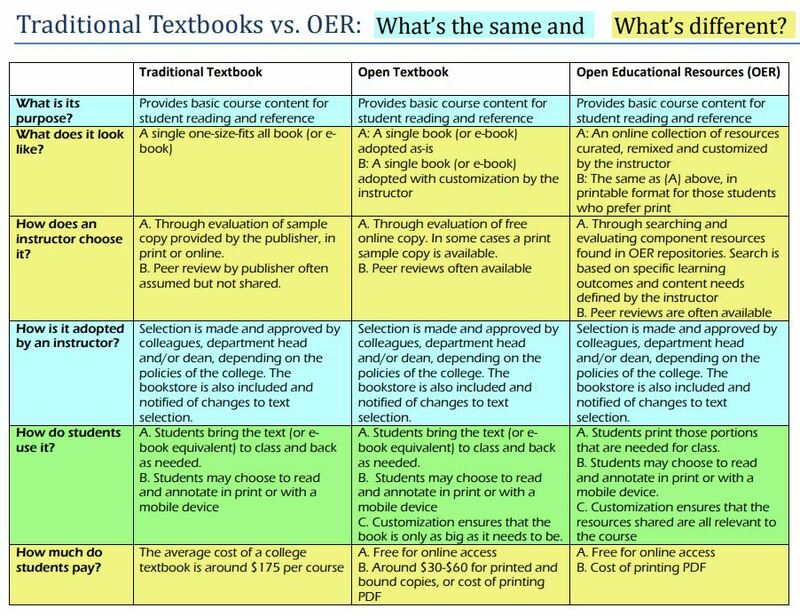 Where have OER been implemented? The good news is that OER are proliferating rapidly; the bad news is that currently, they are very distributed (no single, centralized repository exists). Recommended tools for finding OER are available here. Support services for OER adoption are available to you on campus! If you have any questions, please contact Sarah Fancher or the Idea Lab.